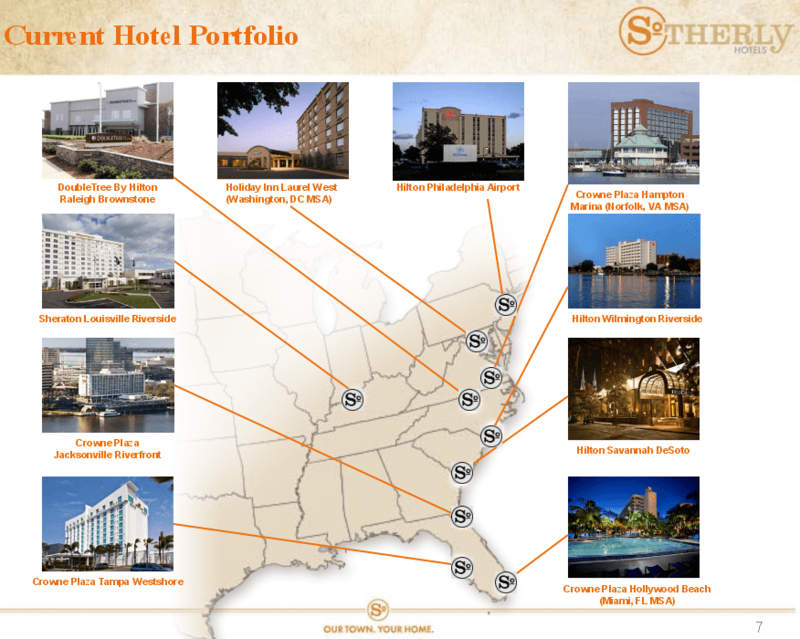 SoTHERLY Hotels, Inc. owns nine upscale hotels located mostly in coastal markets in the American Mid-Atlantic and Southeast, as well as a minority interest in another hotel in Miami. SoTHERLY’s properties produce nearly twice the EBITDA they did in 2005 and the company has made great progress in replacing expensive financing with mortgage debt. Despite its solid operations and improved balance sheet, SoTHERLY offers a distributable cash flow yield more than twice its competitors. SoTHERLY Hotels is a REIT and is listed on the NASDAQ as SOHO. Here’s a map of SoTHERLY’s properties from a presentation the company made in June. First, a little explanation. Like many real estate companies, SoTHERLY conducts its business through a limited partnership. SoTHERLY’s limited partnership is called MHI Hospitality, L.P. SoTHERLY is general partner and holds a 77.6% ownership interest in the LP. The remaining units are largely held by management, chiefly the Kim family that founded the company back in the 1950s. SoTHERLY reports its funds from operations on a per share/unit basis, so shareholders must be careful to adjust the reported funds from operations for the 22.4% economic interest that belongs to limited partners other than SoTHERLY Hotels, Inc. This is not a potential conflict, just something shareholders must know and adjust for. Then there’s the fact that a REIT cannot actually operate or manage the properties that it owns. To deal with this restriction, SoTHERLY leases its hotels to one of its subsidiaries, MHI Hospitality TRS, LLC. That subsidiary is required to pay federal taxes, which are then rolled up into SoTHERLY’s results. The effect is that SoTHERLY Hotels, Inc. is a tax-paying REIT, a truly strange animal. MHI Hospitality TRS, LLC has entered into contracts with a management-owned company called MHI Hotels Services to operate and manage the leased hotels. The company discloses in its annual report that these management contracts were not negotiated at arm’s length and the company could potentially pay less to an independent company. These contracts also contain provisions for large cancellation fees. The company also discloses that its decision-making may be affected by the Kim family’s desire to avoid taxation. The Kims enjoy a partial tax indemnification agreement with the company, though this expires in 2014. These conflicts are worth noting and investors should monitor management carefully. However, thus far management seems to be reasonably focused on creating value for all shareholders. Compensation for top officers is reasonable, and the Kim family has adequate incentive to increase dividends and share value because the value of their ownership stakes far exceeds their annual compensation. With those caveats on the table, let’s take a look at the financials. Hotel occupancy and profitability has risen steadily over the last several years. 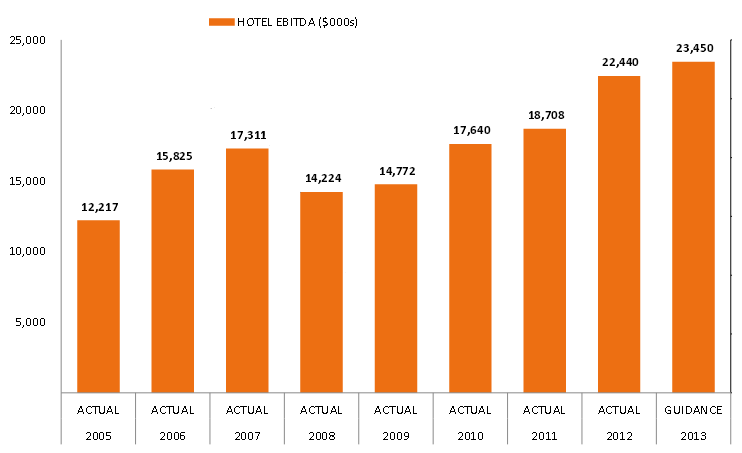 Here’s a look at yearly hotel EBITDA before corporate costs, adapted from the June investor presentation. Growth in hotel earnings has been increased by additions to the portfolio, but also by improved occupancy. The financial crisis hurt hoteliers badly as businesses and consumers reduced travel. Average occupancy in SoTHERLY’s hotels in 2006 was 69.7% and daily revenue per available room was $78.26. In 2009, occupancy fell to 60.4% and daily revenue per available room was $64.71. Only recently have results improved to close to pre-crisis levels. SoTHERLY’s 2012 figures show occupancy of 68.9% and daily revenue per available room of $78.65. The company’s improved results at its hotels have driven operating income to record levels: $10.31 million in 2012 and $11.29 million for the twelve months ended September 30, 2013. Balance sheet improvements are the other half of SoTHERLY’s improved cash flow equation. The company has made huge strides in replacing expensive financing with cheap financing, pushing out debt maturities along the way. 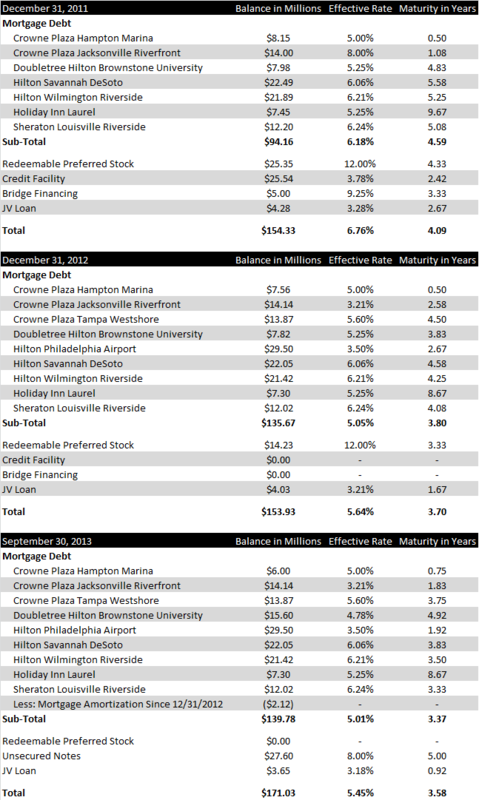 Here’s a comparison of the company’s debt load at year-end 2011, year-end 2012 and now. Since year-end 2011, SoTHERLY has managed to reduce its cost of debt by 131 basis points, from 6.76% to 5.45%. The financing mix has been shifted away from lines of credit and redeemable preferred stock in favor of mortgages and unsecured notes. The average debt term has grown worryingly short, but the company has been making progress in extending its maturities, including refinancing the Doubletree Hilton Brownstone University hotel to a 2018 maturity and the Holiday Inn Laurel property to a 2021 maturity. Improving hotel results and lower cost debt have enabled SoTHERLY to generate increased funds from operations. As usual with real estate companies, the income statement provides a poor picture of actual earnings. Funds from operations is a better metric that strips out depreciation and amortization as well as unusual or non-recurring items like gains on property sales and in SoTHERLY’s case, non-cash losses due to the increasing value of its outstanding warrants. 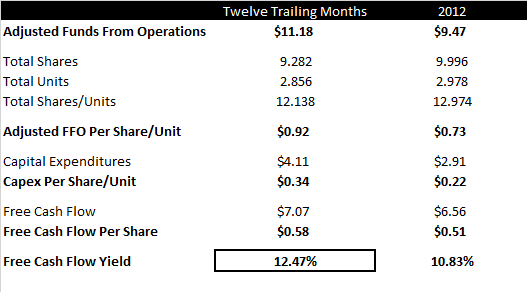 For the trailing twelve months ended September 30, SoTHERLY Hotels produced 92 cents per share/unit in adjusted funds from operations, a 26.1% increase over 2012. At a share price of $4.67, the 92 cents per share in adjusted funds from operations represents a rich AFFO yield of 19.70%, much higher than any of SoTHERLY’s public competitors. The eight smallest hotel REITs I could find have FFO yields averaging 6.1%. On a cash flow basis, SoTHERLY trades much cheaper than its peers. Then again, relative valuation matters little to me unless a company is cheap on an absolute basis in terms of P/E, free cash flow yield, or assets. 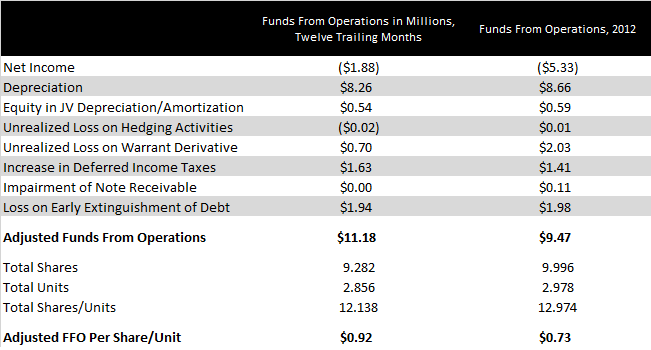 Funds from operations tells part of the story, but it doesn’t include the cash drag of necessary capital expenditures. While a large part of a hotel operator’s depreciation charge is non-economic, some level investment is still necessary to maintain the competitiveness of its properties. Even assuming all of SoTHERLY’s capital expenditure goes toward maintaining its properties at their current levels of quality, SoTHERLY still offers a generous free cash flow yield. In both 2012 and over the last twelve months, SoTHERLY produced enough free cash flow to yield over 10% at the current share price. By comparison, some of its competitors offer scarcely any free cash flow after taking capital expenditures into account. In a few quarters, SoTHERLY’s trailing cash flow could look even better. Remember that trailing numbers are depressed by the expensive preferred stock that was paid off only very recently. If the US economy picks up steam, hotel occupancy could push results even higher. Sustained higher cash flow will enable the company to continue increasing its dividend, which currently only consumes 31% of free cash flow. I expect the market will eventually notice SoTHERLY’s improved results and healthy yield and award it a more reasonable price. One last big consideration for SoTHERLY. Now that its balance sheet restructuring is complete, the company is on the acquisition trail once again. In its earnings call for the most recent quarter, the company confirmed it is very close to announcing an acquisition. If the acquisition is attractively priced and easy to integrate, all will be well and shareholders will benefit from increased cash flow. If the company overpays for the new hotel and has trouble integrating it with the existing portfolio, there could be trouble. Management has been in the hotel game for a long while, but that’s no guarantee that things will go smoothly. Accounts I manage hold SoTHERLY Hotels, Inc.
Long SOHO. I was wondering why the stock shot up yesterday. Now I know. I agree SOHO is undervalued and I think in this case the pros outweigh the cons. Just to note they bought back I think about half the warrants from Essex last month and based on the conference call it sounds like they plan on buying back the rest of the warrants before they are due (which was extended to 2015). One of the analysts asked why they just didn’t buy back common shares. Management replied that it would be hard to do so due to fact that the stock is so illiquid. I emphasized the risk factors but I agree, this stock deserves a much higher valuation. I did listen to the call and I’m pleased that management will try for the rest of those warrants. The warrants are a solid investment at this share price. I attempted to use SPPR as a comparable when scoping out FFO yields, but the company is such a mess I didn’t even bother. I’m going to take a look at Lakeview and Royal Host. I think your share count is a bit off and your AFFO is a bit higher resulting in your AFFO yield closer to 20%. From recent 10-Q. Limited Partners: 12,907,743 units issued and outstanding as of September 30, 2013 plus the 1.9mm warrants as of Sep 30, 2013. The other 1mm warrants will cost at least (4.67-2.5) = $2.17mm +1mm = 3.2mm to retire. Either way, subtract $6mm of cash or subtract $3.2mm cash and add 460k sharescount at $4.67/share through cashless exercises toward a total of 13.4mm shares O/S. AFFO yield is still higher than peer group. But EV/EBITDA is 11.2x, not exactly an out of the world bargain when viewed from a EV/EBITDA multiple rather than the AFFO yield. If you use Felcor’s 2014 EBITDA projection, you get to a 12% AFFO yield as well. Summit Hotel is at a 12% AFFO yield now (using their AFFO). From an owner’s perspective, it’s also important to take into consideration the Debt to EBITDA ratio, interest coverage ratio, and past trough EBITDA/interest payment. The short duration of the debt, while cheap, bothers me. SOHO’s DEBT to EBITDA is about 8x. In essence, the asset yields about 8.3-8.8% net of Corp G&A, with the cost of debt being 5.45%, the equity holder is arbitraging about 3% on the $150mm of net debt which equates to $4.5mm. In this low rate environment, high debt levels helps to accrete to AFFO for the shareholders. I would be more comfortable if the duration on the debt is further out. My personal rule of thumb for interest coverage for real estate companies is 2x for apartments, office, diversified retail. Office and diversified retail tend to have longer leases and people tend to still need a place to live despite a market downturn. Hotel results are known to swing wildly during market peak and troughs. As a matter of fact, EBITDA/interest expenses approaches 1.0x during 2009. When bad things happen to real estate companies, they tend to happen all at once, i.e. debt maturity, lower EBITDA, lenders getting worried. If the average maturity of the debt is greater than 6-7 years, I will sleep a lot better as a shareholder. The fact that the company had to borrow 12% preferred and issue 1.9mm warrants to do a deal in 2011 bothers me as well. While I love hidden real estate plays, I am bothered by most real estate company’s “inability to buy assets during market crisis and their willingness to buy assets when the credit spigot opens up.” They tend to operate right alongside the vicious RE cycles. I would also like the debt to longer term, but it’s always a balancing act between interest expense and rollover risk. Management teams would do well to be more counter-cyclical in their strategies, but I understand why it is difficult to go on the hunt when the market is in turmoil. Just at the time that buying a property is the least risky, banks are the least willing to lend, so reasonable financing may not be available. I really don’t blame management teams for hunkering down and deleveraging when the economy is in rough shape. Thanks for your comments here. They are useful. Have you spoken with management? Are they open to investor inquiries? I have not spoken with them, but they took lots of questions on the recent quarterly call. They seem open to dialogue with shareholders. Acquisition news. Bought a hotel in Houston. Are you still holding this? Seems like their equity offering was dilutive…and the loan maturities are still not far enough. The TTM FFO/share seems to be $1.1 but this was depressed by hotel renovation, etc. What FFO are you modeling going forward? I read an article under a comparable title some time back, anyway this articles quality is a ton better. How you do this..